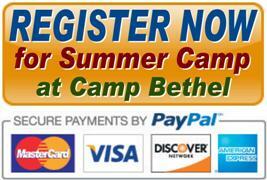 Join your friends from First Baptist Church in Roanoke at Camp Bethel! Squeeze three excellent camp days into your busy summer! You’ll get a “heaping helping” of Resident camp-living and playing in the outdoors while building Christian friendships with counselors and cabin mates. You will lodge in a gender-separated cabin and spend each day with your co-ed family-unit of 10-12 campers and 2-4 counselors. You and your unit will plan your activities including swimming, group games, crafts, nature lessons, creek-play, parachute games, archery, climbing wall, orienteering, group challenge & initiatives course, GaGa Ball & 9-Square, Morning Watch, Bible study, special evening programs, night activities, skit night, daily group duties, hiking the camp trails, a polar bear swim, hosting meals, and nightly worship around the campfire. Amazing what we can fit into 3 days! 1. Make your payment below through our secure "Register Now" PayPal button using any major credit card or a PayPal account. You must pay in full to register on-line. There are no additional fees or surcharges for on-line registration, and you will be able to review your fee prior to payment. 2. Submit Data: After paying successfully, PayPal will direct your browser to our secure on line 2017 Summer Camp Registration Form (which is a Google Form). Allow at least 15 minutes to complete, and be as thorough as possible before you SUBMIT the form. If your browser doesn't redirect you to the Registration Form, please access that form HERE. 3. Get your Confirmation Packet: After submitting your Registration Form, ​your browser will direct to Camp Bethel's Confirmation Packets page (for you to print). We'll also send you an e-mail with links to your packet which includes your gear list, a required Health Form (to be completed and returned to Camp Bethel) and important information about your program.